I've been using Adobe products for nearly 20 years now, and in the past, I would have my employers dutifully buy me copies of Photoshop at every upgrade cycle. Now that I've been on my own for a few years, last year I finally outgrew an old copy of photoshop and decided to bite the bullet and buy a full blown copy of the entire Creative Suite 5.5 Master collection, at around $1800. I heard about the new CS 6 betas for months and was surprised when people I follow on twitter started talking about the final version. As a customer of Adobe's with ColdFusion, they're usually pretty on-the-ball about notifying me the moment something new is on sale, and even though I spent $1800 back in September, I didn't see any emails or notifications on my Adobe account that there was a new version. I needed Photoshop and Illustrator on a new laptop, so I went ahead and bought an upgrade to CS 6 for $375. I was logged into Adobe.com at the time, and I didn't see any "upgrade here" or "buy here" links from my previous orders, so I went through the options and it looked like the cheap upgrade would work. I installed the upgrade version, put in the serial number they gave me, and was asked for a previous version serial, which I also copied off my Adobe.com account history, but I was met with the following error (I blurred the numbers, but you can see the old ones matching up on the last four digits and still being told this was wrong). Annoyed, I followed the customer support links and read the articles about serial number activation issues. Eventually on a support page I was viewing, a "chat with a support person?" popup displayed on a page and I went ahead and explained my situation to a support tech. We solved the issues by doing this weird code-number-handshake thing that was a secret screen in the installer, and once given a secret code from the support tech, everything worked fine. So to recap, after spending over $2k on software, about an hour of frustration while searching for a fix and talking things through with a support tech in a chat, I solved my problem on one computer (I also want to install this on my desktop). 1. When I'm logged into Adobe.com, my previous orders should present direct links to buy qualified upgrades at qualified prices. I shouldn't have to decipher a product matrix to determine which upgrade I should buy. 2. Same issue, but on the launch day of CS 6, I should have gotten a direct email offer to upgrade my CS 5.5 version with a link to buy/download CS 6 that bypassed the options. 3. If you get stuck in the serial number upgrade loop like I did, you can bypass it by installing CS 6 as a trial, which requires you to login to Adobe.com. 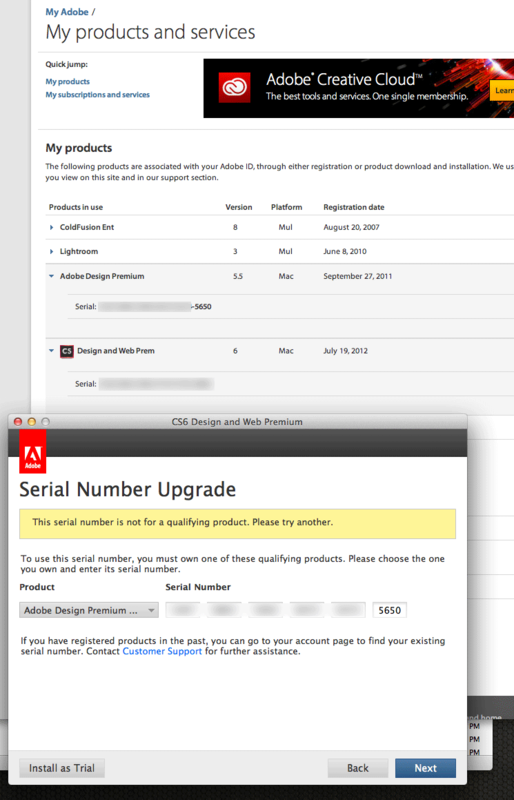 If the installer lets me login to Adobe, why not fetch my serial numbers directly? If you need me to verify any previous purchaces, why can't I simply pick products from my previous purchases with a click instead of having to enter long serial numbers? 4. The "support code" option is a total hack and being non-reproducible on my other computer, means I'll have to go through this all over again. That you even had to build this nuclear option into installers reveals deeper problems. Seriously Adobe, you've been at the pro software game for 20 some odd years, you have a great web site and team, and I can't believe I'm still having problems installing thousands of dollars worth of software in this day and age. In my experience, this kind of thing occurs from people ‘not eating their own dogfood’ enough. I’ve often seen the decision making individuals being presented with idealized scenarios that remove them from the process and circumstances the average person encounters. I doubt that the team that approved the release of CS6 actually ever used the same process you did to test upgrades. Likely they had an alternate method to generate keys and was assured by a separate team that the buying process was simple. You’re not alone. I had to go through the same thing. Don’t even get me started about their issues with volume licenses. I do support for a friend’s design shop and the nightmares we’ve had with Adobe’s various tentacles, each of which don’t communicate with each other, has been maddening. Isn’t there an “de-blurring” feature coming to photoshop? …your serial numbers are MINE.. I had a corporate license for Adobe and I swear, each time I went to install CS on a computer I had to call Adobe. This was a few years back, but it sounds like they still have issues. Adobe have been in business long enough to know how to make these issues simple. It never fails to amaze me why companies like adobe talk about how user friendly their software is yet their unable to resolve their serial numbers. Other companies, such as Blizzard Entertainment, have prevented this completely by adding a device (about $7 extra) that randomly creates a number to work the programs. Look it up.